Apple and Sour Cream SliceAlways a popular choice! 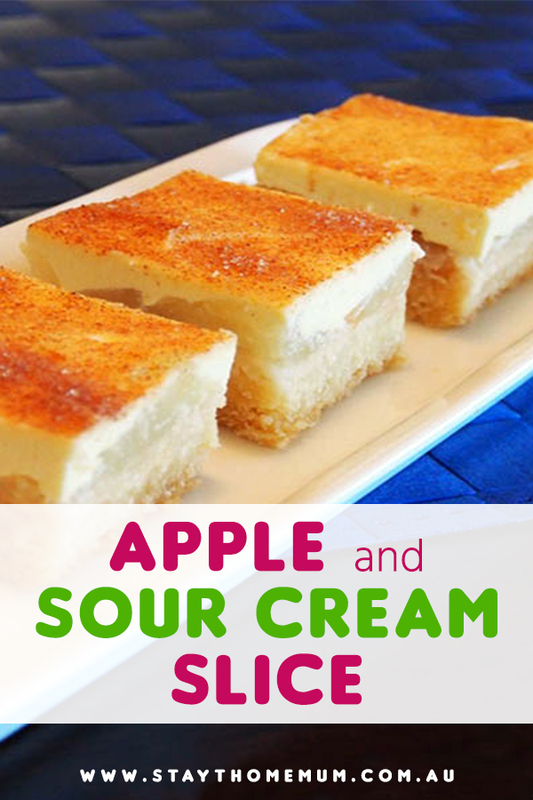 This Apple and Sour Cream Slice is one heavenly dessert. Sweet, tangy melt-in-your-mouth deliciousness. We love how well apple and sour cream go together. The two layers just complement each other so well! This Apple and Sour Cream Slice recipe serves 6 people – it’s perfect with afternoon tea and will keep your guests happy! Plus, it is super easy to make! I like to sprinkle this one with cinnamon sugar on top or when I’m in the mood for something less sweet, then I sprinkle it with just cinnamon. Let us know how this recipe went for you! PS. I have tried this with pears instead of apples and it’s also super tasty too! 1. Grease a 20cm square cake pan, line with baking paper. 2. Combine the cake mix, coconut and melted butter, press into baking tin and cook for 15 min or until lightly browned, cool slightly. 3. Spread apple over base evenly then spread sour cream over the top sprinkle cinnamon sugar over and cook for 20 minutes at 180 degrees or until sour cream is set. Keeps well in the fridge for three days covered in plastic wrap.